Home of your favorite not-so-usual brunch specialties. 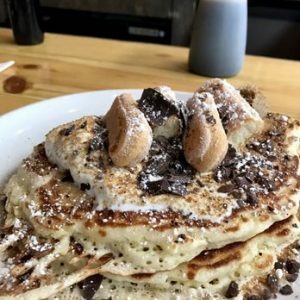 Jack Flaps is a great little spot in Ohio City that will set itself apart from all your usual spots with one walk through the door. 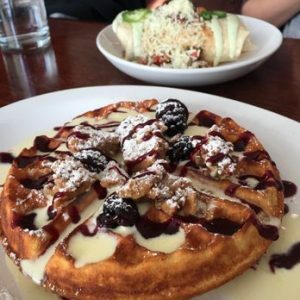 Complete with delicious waffles and pancakes, an inviting ambiance and friendly staff, you will find yourself adding Jack Flaps to your regular routine before you know it. The waffles are just as good! Most notable is the “Graham Cracker” (S’mores-style, Nutella, marshmallows and chocolate syrup). Other highlights include the “Bourbon Apple Crisp” (Toasted almond granola, bourbon apple syrup and caramel cream) and the “Peanut Butter Cup” (Spicy peanut butter sauce, shaved chocolate, local Chocolate 76 peanut butter cups). If you are not the sweet breakfast type, be sure to check out their savory options. Fans rave on the “Real F’ing Breakfast Burrito” (Adobo-braised beef, hash, scrambled egg, crema, smoked tomato salsa and cheddar) as one of their go-tos. Others love the original “I, Jack! The Pumpkin King – Benedict” (Smoked ham, toasted pumpernickel, pumpkin hollandaise, fried eggs and scallions) and the “Benedicto Mexicano” (Jalapeno cornbread, chorizo-ranchero gravy, herb crema and sunny-up eggs). On top of all these exciting choices the other reason regulars keep coming back is due to the fact that nearly everything on the menu is gluten-free. Additionally, much of the menu is vegetarian and vegan-friendly making it a great place to bring everyone in your life. The interior of this spot is quaint, much like the other establishments in Ohio City. 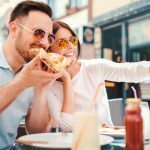 It has a trendy atmosphere that’s perfect for couples. While they can handle large parties, it is likely that you will not be nearly as comfortable (and you will have to wait longer). The large storefront windows bring in the sunshine and light the entire place and will be sure to lift your spirits simultaneously. They do have a smaller, downtown location in the 5th Street Arcade that has a limited menu and coffee. Perfect for a quick pit stop while bustling around E. 4th Street or on the commute to work. Overall, this is the perfect brunch spot, especially in the popular Ohio City neighborhood. Only a five to ten minute walk from all the excitement on the famed West 25th St., Jack Flaps is the perfect start to a perfect day! Jack Flaps is open for breakfast and lunch Monday through Friday 7 am to 2 pm and 7 am to 3 pm on Saturday and Sunday. Stop in at the Ohio City location at 3900 Lorain Ave. Cleveland, OH 44113. Contact the restaurant via phone at: (216) 961-5199.